The Apollo discus cage can remain erected all season. That means throwers can train 24/7. Most cages have low wind ratings and spend most of their life in an unusable condition because the net is lowered. When you buy a Play Hard Sports cage the nets can remain erected in most wind conditions. Net can remain erected in winds up to 62mph (100kph). Reduced number of support poles – for better vision and reduced risk of implement damage. Athletes can train all season in a fully erected cage. Check out our Apollo Installation Video! Rails provide extra net support points. The four poles are made from steel, aluminium and composite materials. Poles are assembled on the ground and walked up into position. Eight vertical ropes tied to ground anchors retain the net in the playing position. Round rope cleats prevent the net from catching. Sleeves support a removable spigot which the poles pivot on. 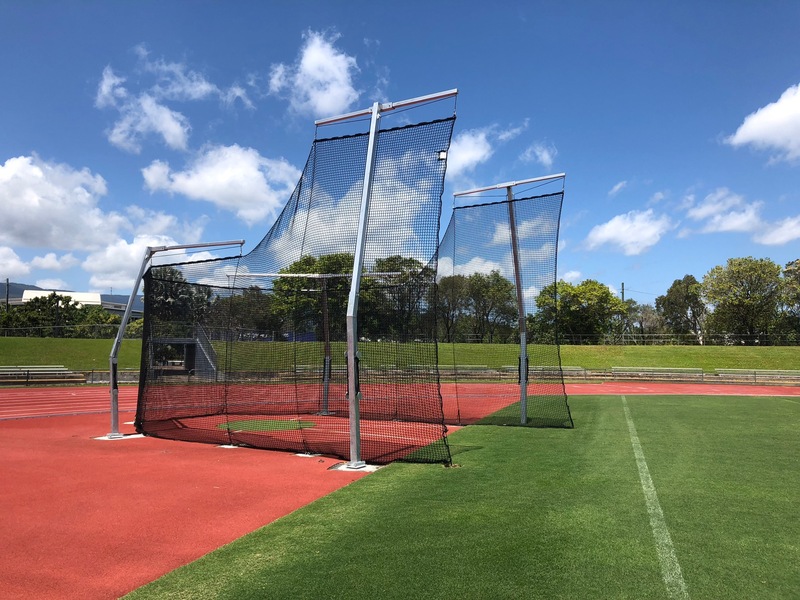 Size 6 metre high at the gate and 4 metre high perimeter net - great for beginner athletes as it improves the safety zone for throwing. Gate distance 7.0m from circle centre. Gate edge Rope and resin composite tube. Pole hardware Rope disc cleats and pulley wheel. Pole material Combination of steel, aluminium and fibre composites. Finish Silver (two pac paint finish optional). Net 44mm square mesh, 2.5mm woven poly cord with 160kg breaking strain, black (green optional), UV stable, IAAF certified. Net support 10 hanging points at 6.0m high. Ropes 8mm black woven polypropolyne. Wind rating Net can remain erected up to 90 km/h. Assembly method Poles are assempled on the ground and raised by hand. Assembly equipment Spanners M20 (3/4") & M12 (1/2'), knife, pliers.